Buy a Cheap Musical Instrument and Your Child will Give Up! If you are looking to invest in a musical instrument for your child or school band, please buy a Good Quality brand of instrument as it is an investment in your Child’s future musical endeavours, enjoyment, life and possible career.In over 20 years of being a Musical Instrument Repair Technician and working for various music stores our advice is to invest in a Good Quality Musical Instrument. Your child/player will get Frustrated, Lose Interest and will Give Up. Poor Quality Cheap Materials - result in the an instrument that won’t play, mechanisms won’t work, parts will bend and break, pads rip and tear, corks crack & split. Materials will rust, corrode & tarnish faster, which will cause parts to stick/jam and fail. Poor quality materials cause instruments to have bad intonation, poor sound quality and it will be difficult for your child/player to play with other children/performers in their bands. If the poor quality instrument keeps falling apart, parts keep breaking and jamming and sounds bad, Your Child/Player will get Frustrated and Give Up. Poor Quality Cheap Instruments Sound Bad. A new beginner needs an instrument that plays as well In Tune as possible. Intonation of a musical instrument is everything. If you can’t tune your instrument you can’t play your instrument. If you instrument doesn’t tune/pitch correctly your child won’t develop their ears to hear intonation, pitch and sound correctly.If a Poor Quality Cheap Instruments Sound Bad: Your Child/Player will get Frustrated and Give Up. ​Your Child/Player will get Frustrated, won’t Practise and will Give Up. Poor Quality Cheap Instruments,if they can be fixed, will need more maintenance and cost more in repairs, more often. Some can’t even be repaired and don’t stay adjusted. We have stopped accepting Poor Quality Cheap Instruments for repair. Poor quality cheap instruments are a waste of our Earth’s precious resources and are “Throw-Away” disposable products, but they should not be. There is no resale in a poor quality instrument, you will waste your money. A good quality made instrument could last for 50 years and be used by many beginning musicians. Buy the Best Quality Instrument, that is affordable, for the level the player needs. or a Great Second Hand Instrument of Good Quality. It is an investment primarily in your Child's musical future, but also an economic investment. If you invest in a Good Quality Musical Instrument the Build Quality is better. The materials are better quality which are stronger so the instrument will last longer. The parts/components of the musical instrument fit together properly so the action/response of the instrument Feels & Responds Better. The Good Quality Musical Instrument has a better centre, meaning it is more In Tune, with better intonation which then Sounds Better. enjoy themselves and stick with playing a musical instrument for as long as possible. Learning a musical instrument isn't easy. It takes time and effort, but is fundamentally rewarding. Good Quality Musical Instruments will last a long time with the correct maintenance and care. Where you win as an investor in a Good Quality Instrument in in the players progression, we aren't wasting precious resources and your resale value. Please avoid putting road blocks in the way of musical learning and exploration. ​Invest in the right tools for the job. Good Quality instruments cost less than a cup of coffee a day! a New, Good Quality, Musical Instrument can cost less than a cup of coffee per day!
. Learning a Music Instrument is a life long journey, this journey starts with a good solid first step in the right direction by providing your child with the best quality musical instrument you can afford. Good Quality instruments play better, sound & feel better. ​This means your child will progress faster and have more enjoyment in learning and playing their chosen instrument. Beginners usually use a good quality student model musical instrument for about 4-6 years before needing to upgrade. The upgrade is due to their playing ability and progression, if they have had a good quality instrument to start. intermediate models future proof your investment for long enough. about 6-8 years before needing to upgrade to a semi profession/proffesional instrument. The 4-6 Year time frame is quite fortuitous as you have had the usage of a good quality musical instrument, had the protection of manufacures warranty and now can receive the return on your investment with the resale of your good quality musical instrument. This resale is what helps you afford the upgrade investment to the professional series instrument that your child now needs to further their progression and musical journey. 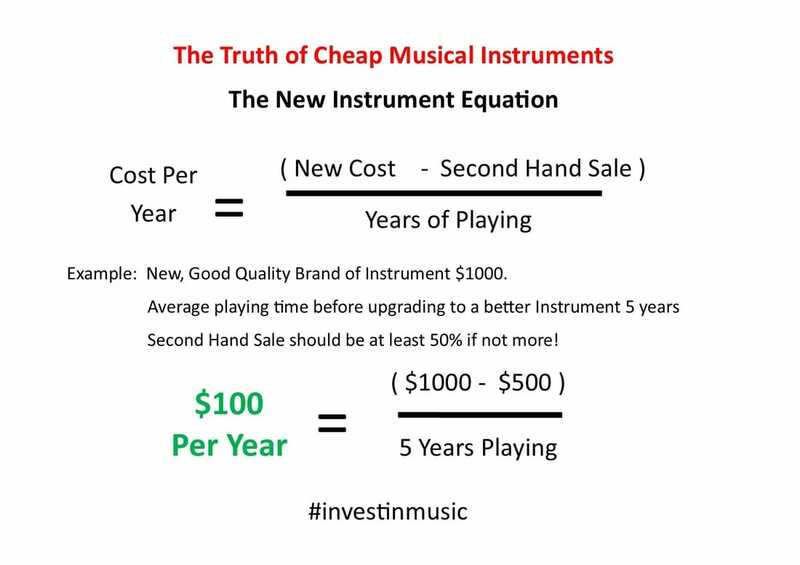 The below "New Instrument Equation" gives you an idea of the cost per year of investing in a Good Quality musical instrument. To anyone looking to invest in a New Good Quality musical instrument. and to prevent you from buying a Cheap Junk Instruments. We will offer 2 years Free Servicing on the purchase of any musical instruments you buy from us. This is a minimum of $250 added value. 2) Bring in a Picture or Link to the cheaper quality instrument.